Your Digital Privacy at work may be compromised! Google Vault: It's a wide open look at how everything we type onto the Gmail sever or Facebook or LinkedIn servers--stays. The digital privacy issue more people need to know about. Is your company email, Gmail? Do they include Google Vault in their G-suite? Well, You probably won't know if they have. But if email privacy matters to you, you're gonna wanna find out. Here's why: With Google Vault . . . Everything you type into Gmail--even Drafts can be saved. When I say "Drafts," I'm not just referring to the ones you saved to your Drafts Folder. Every iteration becomes a "draft" or variant of that email and is saved to the Google Vault. To be clear, it's not just the email you click "send" on. It's everything you type to get the click. Typos, rethinks, anger, errors, backspaces, deleted words. All of it. Every. Single. Keystroke. Every Google Vault has at least one Administrator, and it can be a number of people: Your boss, the IT guy or another peer in the company. Essentially, the Administrator has access and can search the Vault. Since everything can be searched, everything is discoverable in a court of law. Furthermore, your privacy is on the line and so is your job. I urge you to protect yourself. We showed our TechWellness employees how to do it, too! The Fix is at the end of this article. Like millions of businesses, we use Gmail. It’s best in class, with great encryption and spam filtering and search. When it comes to technology and privacy, Google has advanced and secure Cloud infrastructure. 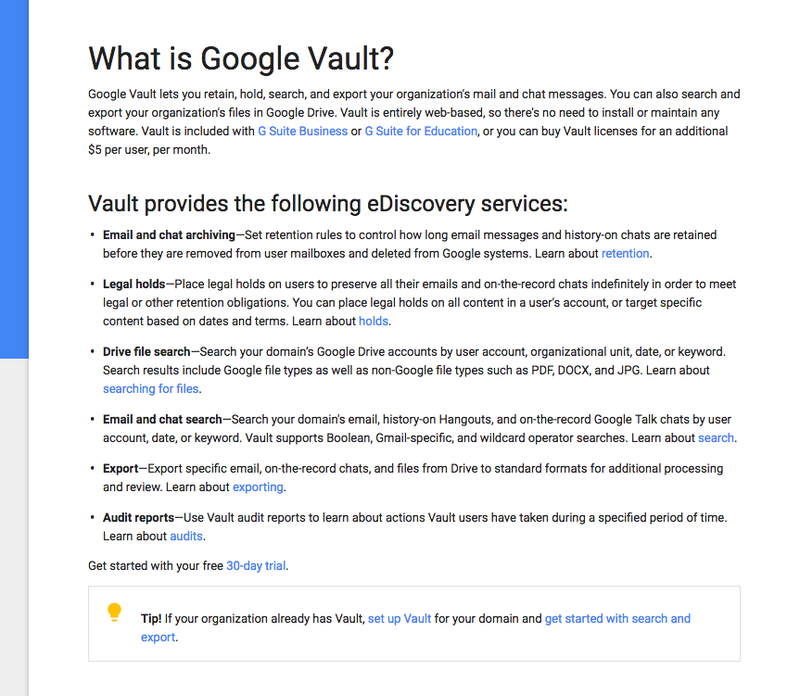 Our IT guy a few months ago suggested we upgrade to Google Vault so that we could archive old emails indefinitely - as a business owner, I value the ability to save company data and communications. Lots of archiving systems can do that... but Google Vault doesn’t just save emails, chats, Hangouts, files (PDF, DOCX, and JPG, Microsoft Word, Excel, Powerpoint) Google Earth and connected Gmail products. Recently, I accidentally discovered that with Gmail and the Google Vault turned on. Virtually, everything an employee had typed, every iteration was saved--sometimes as many as 50 versions of one email! What Do Employees Think When The Boss or IT guy can read E V E R Y T H I N G? For one - Employers. It’s great for finding and retrieving valuable company information and data, even from closed accounts. The things hidden in drafts can be very revealing. Who else loves it? Lawyers. Everything in the Vault may be “discoverable” - meaning it could be subpoenaed in a lawsuit or criminal investigation. It’s called e-discovery, the process of seeking and finding information in electronic format, in response to legal matters and investigations. Note that many archival systems can and do save company communication for the purpose of litigation. Vault makes this super easy as it uses Google-patented search to access data in email and attachments including Word .docs power point, attached PDF's, Hangouts, chats etc. and . . . everything typed onto a company mail that's connected to the Gmail server. This is the part that really concerns me: The words you type into Gmail are saved—the thoughts you wrote and then deleted or wrote over—those are saved and may be discoverable. Now, truthfully, it would be a rare occurrence for drafts in the Vault to be subject to search, but not beyond the realm of possibility if circumstances were compelling. If they were discoverable would someone be guilty or complicit by virtue of their thoughts?? I don’t know, but I like to think my thoughts are just...well, mine, and subject to change. UHH, But for How Long? Incredibly, employers or administrators can set the time period for data to be retained up to 36,500 days! That's 100 years. When an employee leaves, an employer can choose to delete the account or “suspend” it. If the account is suspended, the data REMAINS in the Vault, long after you've left that particular workplace. What do Privacy Experts Say? "Almost anything an employee does on an office computer can be monitored. Courts often have found that when employees are using an employer's equipment, their expectation of privacy is limited." Excellent advice, Dr. Tsamitis. Of course, my entire team is now well aware of our utilization of and the privacy implications of Google Vault. As an employer, TBH, I’m not stoked about seeing or saving drafts. Honestly, looking at a draft that wasn't sent makes me uncomfortable. It's creepy. I feel like I’m spying and looking at thoughts and words that were not meant to be shared. I realize I can choose not to search drafts and I intend to exercise that option—now that I’m done experimenting and researching for this article. If Cloud-based Google Vault has the ability to save every Gmail written on its live server, that probably means that anyone writing in Gmail should assume that all words are saved and/or could be stored and accessed. The same holds true for most if not all files stored in the Cloud. More then ever, we should be very mindful of everything we do and put online. As I said in the Cookie Video, when it comes to ALL your internet moves, Digital Privacy is Absolutely NOT Guaranteed. Practice mindfulness when online. In This Connected World: Writer Beware. Remember, if you use Gmail at work, you may have no idea if your employer uses Vault on their end. So, first things first - ask! Ask HR, ask the IT guy. We're not sure what your employer is obliged to tell you -but it doesn't hurt to ask. I contacted Google about eliminating the option to save drafts. A customer service representative of Gmail verified that there is no option to “not save” drafts at this point, but did offer me the opportunity to suggest the change to developers. So, I submitted the idea to Google as they directed through the Features program. Option 2: IF you have an older version of Microsoft Office you’re Golden. It used to be the apps were never connected to the internet. Type into TextEdit or Word. Compose to your delight in those apps, cut and paste directly into your Gmail or Mail Client. This option works only on Non-cloud based. You can do this with the new versions, but you run the potential of the version being saved on Microsoft servers, depending on your settings. Option 3: Disable Internet connection: You compose, delete, type over and write anything you want and then, when that draft is in final form, you can reconnect to the internet and send or save just the final draft on the server. Prior to disconnecting from the internet, you can open Gmail. Then, disable internet and Gmail allows you to “compose” as many different emails as you’d like. Each time you click “COMPOSE” a new window pops up. You can also compose in a mail client or use Word or Stickies or text editor and then cut and paste to Gmail or your mail Client. We've got more digital privacy protection with sassy and fun CreepBlockers. Make sure you get yours!